I can guarantee that Breville BOV800XL Smart Oven is a definitely amazing product which provides a commercial grade cooking experience. Based on the simple fact that different kinds of foods require different heating methodology, the Breville BOV800XL Smart Oven 1800-Watt Convection Toaster Oven with Element IQ is an amazing appliance to have in your kitchen. This product not only provides consistent distribution of heat to the food inside, but can also adjust the magnitude of heat distribution according to the kind of the food for perfect results. This 1800-Watt, beautifully designed appliance provides the customer with an amazing cooking and baking experience. It contains five individual quartz heating elements, one more than the previous models, which assure smooth and timely cooking of food. Breville BOV800XL has large baking capacity. It can fit a 13 inch pizza and 6 toast slices while its previous models could fit a 12 inch pizza and only 4 toast slices. One of the best features of this Breville product is its Element IQ technology. This smart feature helps in consistent and even distribution of heat to the food. Another brilliant advantage of this technology is that it adjusts the heat distribution for different kinds of foods. This provides the customer full control over the heat and helps in easy cooking, baking or broiling for perfect results. In my research, I found till now none of other toaster ovens have as many functions as this model. It contains 9 pre-set functions to help the users choose the best setting for the type of food they are cooking. These functions are: bake, broil, roast, cookies, reheat, pizza, bagel, toast and warm. The warm feature is the new added feature not present in the previous model. Although these options come with recommended settings, the user can customize the settings to personal taste or according to the recipe. These customized settings will remain in the memory of the oven until they are changed or it is unplugged. This product contains 5 separate quartz heating elements placed at different angles to provide proper heat. These heating elements help cook the food quickly and smoothly. In addition, this appliance can also adjust the wattage of these elements from 1800 Watt to lower values of power, providing the customer complete control over heating as well as the power by simply rotating a knob. This Smart Oven has an amazing feature for even heat supply called convection cooking. Convection cooking uses a fan which circulates hot air throughout the cooking process to cook food at the same rate. This is particularly useful in baking delicacies that need to be cooked smoothly. Along with the above mentioned features, the Breville BOV800XL Smart Oven comes with some more added features. This stainless steel housed product has a tray which keeps the plate warm. The interior contains 3 rack positions which are non-stick and easy to clean and a removable pull-out crumb tray while the exterior has a stylish look. It also comes with three pans which are pizza, baking and broiling pans. A very helpful user manual which contains all the information regarding its operation is also included. Some other nice features include a tempered glass door and an LCD which turns orange during preheating and cooking and blue once the cooking is complete. This LCD also calculates the correct time and temperature for cooking. What Do Customers Say About The Breville BOV800XL? Energy and Space Saving – Customers say that this model saves lots of energy and some space for them. It is energy efficient as it uses approximately 50% less electricity than regular ovens. Despite having larger capacity than most ovens, it fits easily even on the countertop of the smallest kitchens. Heat Distribution Control – Another advantage of this oven is that it allows the user to fully control over temperature distribution. This is made possible with the help of element IQ technology. This technology changes the way the heating elements work. Previously, the heating elements just used to turn on and off but with element IQ each of these elements can be controlled individually to provide proper heating whenever and wherever it is required. This feature made this oven outstanding and is the biggest reason driving users to pay money. Timer – The timer used in this oven is a great help to the user because it turns off automatically after the cooking is done. This does not just happen for one or two functions, but for all 9 of them, which wins the user favorite. This function is really useful as it prevents the food from overcooking or burning. Versatile – This Breville oven provides perfect settings of heat and temperature in its 9 pre-set functions. It is praised by most owners for bringing much convenience in setting to satisfy different cooking needs and therefore saving lots of time. Apart from the 9 pre-set functions available, the user can also set customized settings for some specific foods or according to personal taste. This is an amazing feature used by Breville and it always gives excellent results whether you bake or broil or use any other function. Friendly Interface – Although this appliance has a lot of cooking options, the customers don’t think it is hard to operate because of its user and environment friendly design. The user interface has been elaborately designed such that it becomes very easy for the user to cook food with this oven. This helps a lot since this product has a lot of cooking options, and it would become very complex for the user to decide how to perform a certain function if the interface is not user friendly. Door – Along with a very good shape and stylish design, the magnetic door helps avoid burns and the doors are sealed completely, which prevent unnecessary heating of the kitchen or surrounding area. If you have done some research then you must know that most ovens have these safety issues on door. Although BOV800XL has a lot of high technology functions, it also has a few minor issues. Most of these issues are not that big in magnitude as compared to the merits of this product. Cord – One issue in this appliance is that its cord is a little short(less than 3 feet) which creates a problem if you do not have an outlet near the place where you want to place your oven. Usually the customers do not encounter this problem since circuits installed in the kitchen are no more than 2 feet away from each other. Heating Up – Another issue is the heating up of the exterior of the oven when you use it for some time. If it keeps on happening regularly, then it is better to use it in a little open space and also use it by lowering its settings and cook at medium temperatures. This Breville oven uses 1800 Watts, so if the kitchen has a single 15 ampere circuit installed, then other power consuming appliances cannot be used at the same time when the oven is being used. Customers also do not encounter this problem because usually there are more than one circuits installed in the kitchen and even normal homes have 20 ampere circuits. 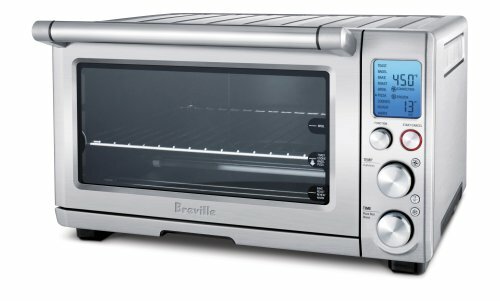 Overall, this Breville BOV800XL Smart Oven 1800-Watt Convection Toaster Oven is an excellent choice for your kitchen countertop if you can afford a few extra dollars. It is very easy to use and has a large number of high technology user friendly features which help the customer cook delicious food. It is also the bestselling product on E-commerce stores like Amazon.